This year at the Canadian Championships in North & West Vancouver there were many changes that were made in an attempt to move the game forward. For years the same model was being used to take on the week long tournament. In order to grow the sport community partners were brought in to help promote the game to their businesses. Games were streamed online for people around the world to see. Championships games were separated in order to give the people in attendance a chance to focus on a few games in stead of a green or two g reens full. Tickets were sold for admission and weekly passes, our players are worth something and the committee felt it was time to instate this. Both opening and closing banquets were held with a gala banquet at the Delta Hotel & Casino. The players even had player passes with lanyards that was sponsored by Ellison Travel. One of the best parts of the Championships was having the games streamed online, as www.bowlscanada.tv was born. 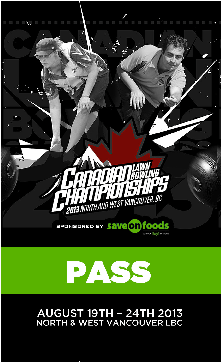 Archived games are available online for people to watch as we have had viewers from around the world take in the Canadian Championships.